How do the Energy Auto-switching Services Compare? If you’ve never switched your energy supplier you won’t be on a good deal, as you will almost certainly be on your supplier’s ‘default’ tariff, which is usually one of their most expensive options. But, even if you have switched, unless this was done in the last few months it’s very likely your tariff is no longer the best on the market. That’s where the true energy auto-switching sites like us – Flipper – come in. We check the market for our members every month to find them the best deal. If a better deal is found which will save them more than £50 vs their current tariff we ‘flip’ them to it automatically. Without all the hassle and paperwork of doing it yourself – we manage the whole process for you. Flipper were the first auto-switching service to launch way back in mid-2016, long before the rest. We came up with the term ‘flipping’, to show that what we do is much easier than normal switching and is the reason we are called Flipper. Over the past few years we have performed more than 39,000 flips for 25,000 households, delivering total overall savings of more than £11,000,000 with an average saving on a first flip of £385. We are rated 8.9 on Trustpilot from over 2,448 reviews. 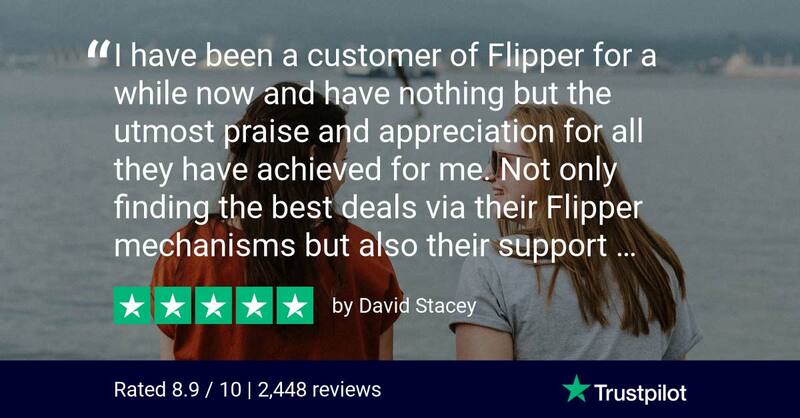 Flipper review on Trustpilot - 29th March 2019. We use the actual data from you bill when searching the market to ensure our calculations are accurate and search all generally available tariffs from as many suppliers as possible. There are a few suppliers we exclude as they don’t provide an acceptable level of customer service – a cheap deal with a poor supplier is not a good deal. Currently we are flipping members to the best deals from over 54 suppliers - that's 3 times as many as you could find on some of our competitors (see below). We manage the whole switching - sorry, flipping - process for our members and check the market for them every month, sending them an e-mail to keep them up to date on whether or not they need to flip again. Our customer service team are available 8am – 6pm Monday to Friday over the phone, by e-mail or even live chat. We charge an annual membership fee of £30 for our service, but that is only paid once we have found you a new deal (which will save you at least £50) and begun the first flip. This fee is paid annually, not per flip. Most of the other sites are free to use as they make their money by taking commission from your new supplier every time they switch you, but this limits the suppliers they can switch you to, how often you can be switched and ultimately how much you can save. Being paid by our members means we are truly independent and impartial, so we can switch them to the right supplier at the any time to maximise their savings. A much more transparent approach where we work for you, not the suppliers. Who are weflip? How does weflip make money? weflip launched at the end of 2018 and are an auto-switching service owned by Gocompare.com – famous for their adverts featuring a large, moustachioed opera singer. Weflip have their own ‘mascot’ too, in the form of a chameleon with and Australian accent – no, we’ve no idea why either. weflip are free to use, but they only compare and switch you to tariffs from which they earn commission from the supplier. They claim to search a ‘wide range of suppliers’, but we have seen results which list as few as 70 tariffs from just 18 suppliers – which is less than a quarter of what’s available in the market – and some of the suppliers shown were those we don’t flip to because of their poor customer rating. They also aren’t clear on how often they will check the market for you after you switch, but as your new supplier has paid weflip to be switched to them, they will need to earn that money back from you before you are ‘allowed’ to switch again. We are flattered that they have chosen to use the ‘flipping’ term, but don’t believe what they offer is proper auto-switching. Who are Look After My Bills? Look After My Bills launched at the start of 2018 and gained a lot of press coverage late last year following their appearance on Dragons Den. Like weflip they are free to use and, also like weflip, they only compare and switch you to tariffs from which they earn commission from the supplier. They say they only offer deals from ‘suppliers who value their customers’ so it’s very hard to know who they can actually switch people to – but it’s certainly a limited choice. It’s also not clear how often they will check the market for you, as they use statements like ‘when your deal is ending’ or ‘yearly’. A year is a very long time in the energy market. In 2018 there were over 50 price rises with some tariffs increasing by nearly 20%, so to be a true auto-switcher you need to be checking every month to make sure your customers current deal is still the best. Finally, they promise they’ll never make you pay exit fees, but in our view if you can still save more than £50 on another tariff after you’ve paid any exit fees on your current deal, then it’s clearly better to move you to the tariff which is cheaper overall. Overpaying every month to avoid exit fees is crazy. Like weflip and LookAfterMyBills they are free to use and, also like them, they only compare and switch you to tariffs from which they earn commission from the supplier. It’s not clear how many they work with, but they only show 30 supplier logos on their site – which is around half of the market. They also won’t switch you that often – normally once a year, unless the supplier they have moved you to puts up their price by more than 10%!!! And, like Look After My Bills, they won’t switch you if it means you’ll pay an exit fee. As noted above, our view is if you can save more than £50 on another tariff after you’ve paid any exit fees on your current deal then it’s clearly better to move you to the tariff which is cheaper overall. Overpaying every month to avoid exit fees is crazy. Finally, you can’t contact them by phone - only e-mail - which is not ideal for many customers. Offering a great service means being available when and how your customers need you. Switchd also launched in mid-2017. 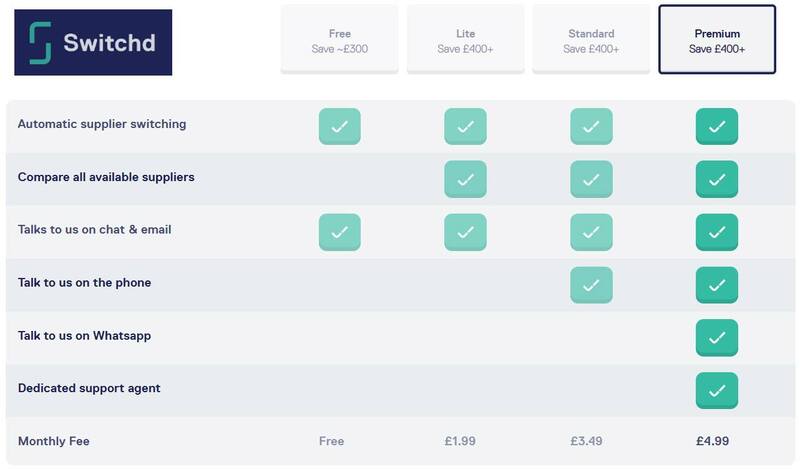 They offer 4 different ‘plans’, from one that’s free - but doesn’t compare all suppliers and so offers savings which are £100 lower that the best available - to one that costs £4.99 per month, that’s £59.88 per year – double the Flipper membership fee. The different plans offer different levels of customer service, but having to pay an extra £18 per year just to be able to speak to someone on the phone doesn’t seem right to us. Switchd make big claims that their customers save up to £572 per year. If you read the small print the £572 is not the average saving, but the amount saved by the 10% of customers who saved the most – ie: 9 out of 10 customers save (much) less than this. Switchd - charge more to be able to speak to them on the phone. Labrador’s big focus is on helping customers get ‘smart’ – by switching them to suppliers who support, or will install, a smart meter. However, this really limits the tariffs and suppliers you can be switched to and therefore the amount you can save. And given they only switch you when a saving of at least £80 is found, you may not be switched very often at all. And while having a smart meter means you don’t have to provide meter readings, it doesn’t mean you are going to use less energy or save money on your bills. We believe the real ‘smart’ choice is to use a service that will find you the best deal available across the market every month. What about the other energy switching services? You may have seen other services such as ComparetheMarket’s ‘AutoSergei’ or MoneySuperMarket’s Bill Manager App being advertised. However, these are not true auto-switching services, they just send you an alert/notification when they think you could save money by switching your supplier to their selected list of suppliers (not necessarily the best deals), and it’s based on the data you’ve provided. If you decide you want to change supplier to one of these deals, you’d still have to manage the switching process yourself. Since Flipper invented energy auto-switching and was the first service to launch back in 2016 lots of other firms have entered the market. However, most of these can’t switch you to as wide a range of suppliers as Flipper, don’t check the market for you as often as Flipper, won’t save you as much money as Flipper and aren’t as easy to contact as Flipper if you need help. So there you have it, Flipper are the original and still the only true auto-switching service. We’re the best choice for getting real peace of mind when it comes to your energy bills.